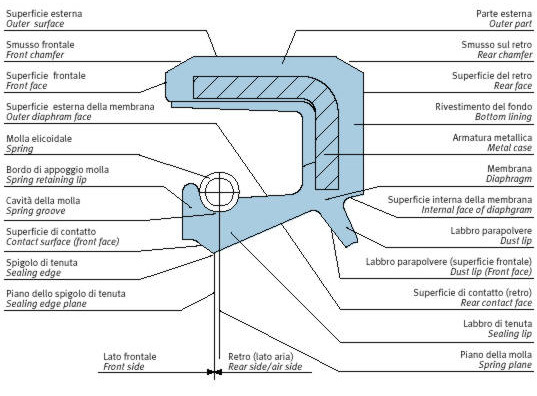 This chapter deals with the sealing of fluids on rotating shafts, a delicate problem that now finds its almost universal solution in the application of a product known as a "rotary shaft seal". The entire discussion is destined for designers and users, as a valid support and guidance for selecting the most appropriate type for their specific uses. The shape of the "rotary shaft seal" is shown in the figure belowe, which also supplies the recurrent nomenclature for the component parts of the ring. The Garter spring, acting as a complement to the fundamental action of the sealing lip (Par. 2.3). (Identification according to the ISO R 1629 standard of March, 1971). - Water and aqueous solutions (lyes). The temperature range varies from -30°C to + 120°C. The temperature range varies from -25°C to + 150°C. - resistance to atmospheric agents, ozone, etc. The temperature range varies from -55°C to + 180°C. - light and atmospheric agents. The temperature range is from -30°C to + 200°C. The chemical structure of this elastomer (obtained by hydrogenating an appropriate type of NBR nitrile rubber) allows achieving, especially if vulcanized with a peroxide system, an average heat resistance 30°C above that of nitrile rubber, and an excellent abrasion resistance. The temperature range is from -40°C to + 150°C. - polar solvents at ambient temperature. The temperature range is from -50°C to + 150°C. The thermal expansion coefficients of elastomers are decidedly superior to those of metals (see Table below). It is impossible, therefore, to merely consider the geometric shape of a shaft seal and its total radial load at ambient temperature, because its operating conditions and lifetime may substantially vary, depending on the change of the modulus of elasticity induced by a temperature change. Its function is to offer the shaft seal the necessary rigidity to enable a stable coupling with its relative housing seating. With reference to the elastomer, it may be of an inner (see par. 2.2.1), an outer (see par. 2.2.2) or a part-coated type (see par. 2.2.3). - It avoids damaging the seating, even if made of a light alloy, thus affording a better opportunity of substitutions without damages. This type of case was designed for applications requiring high pulling forces and automated motions based on magnetic systems. In time, it has also been shown that in order to achieve a reliable seal, a ground outer finish and a finely machined seating was needed in addition to the use of sealing materials. Its cost was considerably higher than that of a coated type. It was therefore decided to use it only in combination with high-quality compounds, where most of the cost increase is compensated by the savings in elastomer materials. At any rate, ROLF solved the problem by producing its seals with their outer surface coated only up to half of its height, as detailed below. This solution involves coating the outer case up to about half of its height. This coating is a result of vulcanization and can be plain or corrugated to better fit the assembly forces required by the customers. This type of locking is advisable for projects requiring a particularly challenging application. 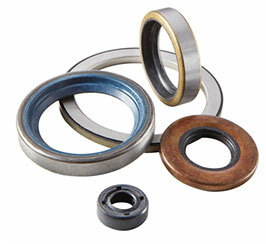 - Brass, to UNI 4894 standards. - at the operating stage: a guaranteed stability of the radial force itself. The temperature effect actually determines, in the course of time, not merely an alteration of the rubber's original characteristics, but also a decrease of the mechanical properties of the steel constituting the spring. The use of phosphorous bronze springs, while having the same chemical resistance as stainless steels, is not recommended because of the instability of its dimensional characteristics and the uneven decay of its load capacity.